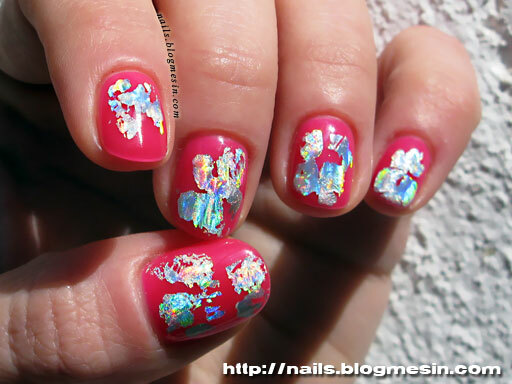 today I have photos of gel polish manicure with nail art foil for you. This is very easy and fast manicure. I stuck the foil straight on a inhibition layer of a last colour coat and before a top coat. Today I want to show you my new Valentines Day Nail Design. Recently I saw a lot of Caviar Nails so I bought some bullion beads for nail art. I put purple bullion beads straight onto the wet top coat. When I started to shape the heart in the middle I noticed that purple bullion beads are bleeding out. I was so unhappy because there was no good way to fix this. For the base and the hearts I used acrylic paint. These paint has some tiny lumps in it so the nail surface is a bit uneven. I actually like it because it gives the rustic finish (it reminds me of oil paintings on canvas). 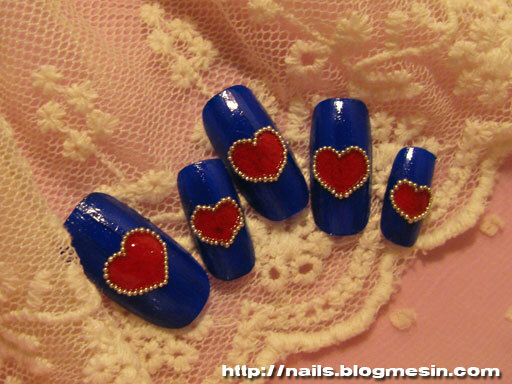 Than I painted the nails with top coat and put bullion beads (not bleeding ones) on the edges of the hearts. The one more thing which I don’t like about the bullion beads I bought is that the beads are not equal size. I guess if you are making caviar nails fully covered with bullion beads the difference in beads size is not so important (maybe it is? ), but if I make lines with beads I want them equal othervise lines look wavy and not so nice. You can see it on the heart made on index finger nail. 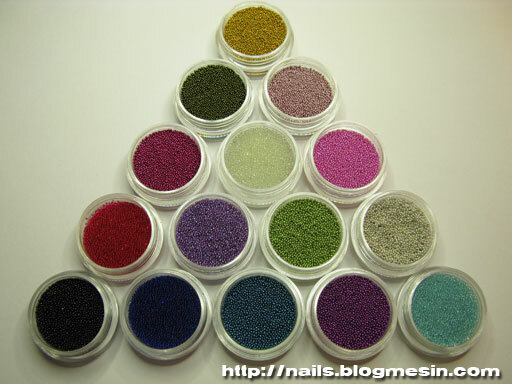 Do you use bullion beads for the nail art? I know that it takes forever to work with them, but I think that the end effect is so lovely! 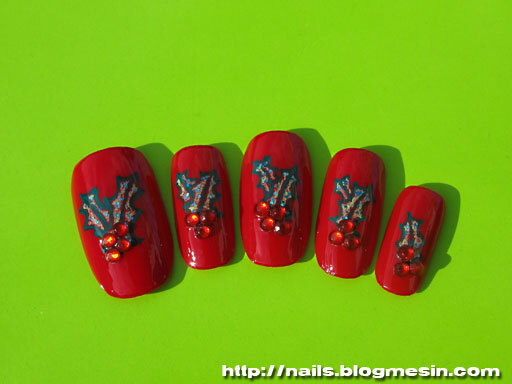 It is already this time of the year when all the nail blogers are posting their christmas nail designs. Everybody come up with their ideas, so do I. 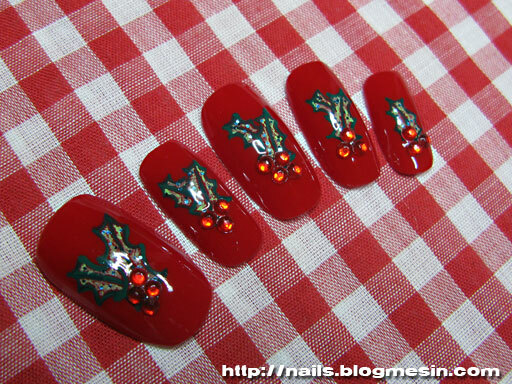 Here is my christmas nail design for this season – simple nail art with Holly. As a base coat I used one of my favourite reds – H&M RED NAIL. Hollies are painted with acrylic paint with a green glitter sprinkled on them. After application of a top coat I added red rhinestones imitating red berries of the Holly shrub. The leafs don’t need to be symetrical which makes this design fast and easy to make. 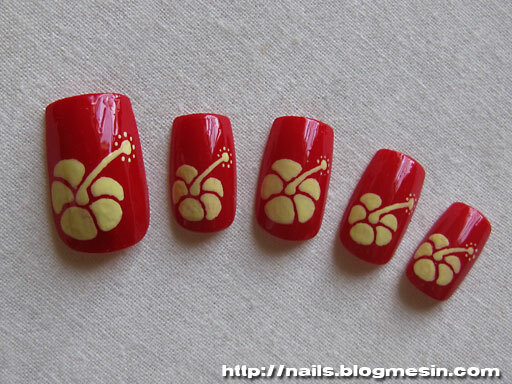 Today I am posting my Hibiscus Nails. Do you like these flowers? I think they are adorable. I think that hibiscus nail art is quite popular right now. I saw stamps, nail stickers and fimo with hibiscus pattern. These ones are free hand painted. The flowers are made with acrylic paint, the background is made with a regular nail polish. When the paint was dry I added two coats of top coat. Painting hibiscus flowers was great fun for me so I guess I will make some more nails with this pattern.